NEW Fiber Internet Speeds are now available! Current customers speeds will be automatically updated. Please note our Fiber Economy package is no longer offered. To upgrade to Fiber, call 330.658.2121 to check availability at your address! Doylestown Communications offers high-speed internet services to both residents and businesses in the Doylestown, Ohio area. Fiber provides the fastest, most reliable internet connection. It is recommended for businesses, as well as those who desire high-quality streaming and gaming. Fiber connections are also capable of simultaneous downloading and uploading. Fiber internet requires replacing old copper wires with fiber lines, a service we often provide free of charge; you can visit our Fiber Installation page to learn more. While we recommend fiber over DSL, please note not all locations are capable of receiving fiber. Please call Customer Service at 888.881.0805 to find out if fiber is available at your location. For more information on video streaming speed recommendations, please visit our Netflix Information page. 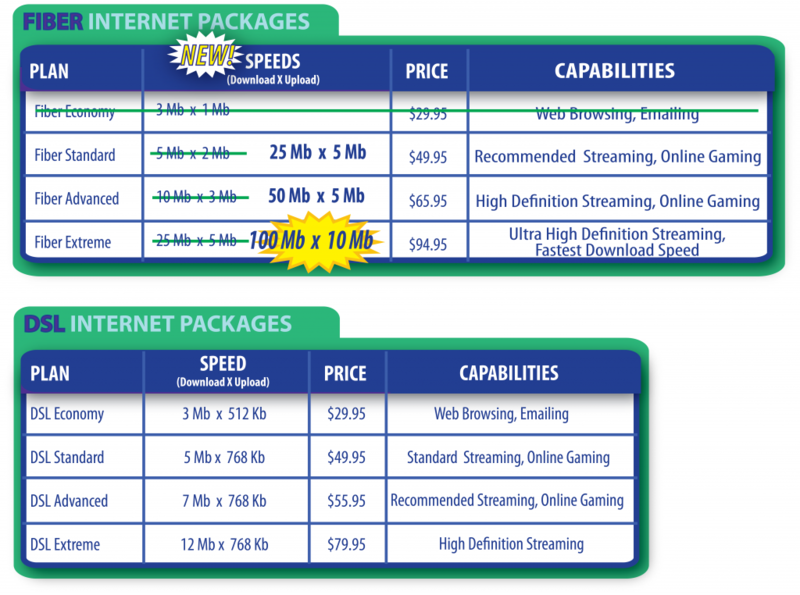 A one-time hardware cost of $39.95 (regularly $65.00) includes our basic high speed modem for your router. For Doylestown Cable customers there is no prequalification required and no term contract. Thank you for choosing local! To start a new service, upgrade your plan, or learn more about our residential and business internet services, please call 888.881.0805 or Contact Us.